To some of us the term “black oolong” can be a bit of a puzzle. We know black teas as one thing and oolong teas as another. Time to take a closer look. First, we here in North America and much of Europe know black tea as a fully oxidized tea where the dry leaves are very dark brown. (In Asia and other locations, this tea is known as red tea based on the reddish color of the steeped liquid.) And oolong lovers know that these are teas that are partially oxidized, ranging from very light to almost full. The puzzle is easily solved here. Hearken back to that earlier statement about different levels (percentages) of oxidation. This “black oolong” tea is from Fujian Province in China and was generally processed in the way a lot of Fujian oolongs are. 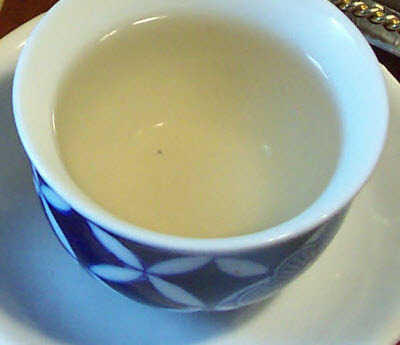 But this tea was allowed to oxidize “longer than our normal Fujian Oolong…”. So how did this particular black oolong compare to regular black teas? The aroma of the dry leaves was rich, nutty, and earthy, not smoky or malty or raisiny or jammy. The liquid (infused three times in water heated to 85°C for 2 minutes, 2½ minutes, and 3 minutes respectively) was pale, not the rich reddish color of regular black teas, and had a thick feel in the mouth that I have not experienced with black teas. After steeping, the leaves took on a nutty, slightly smoky (peat-like) aroma in the cup, with a smoky, slightly cocoa-ish flavor. That smoky, cocoa-ish quality was in the cup, too. These “black oolong” teas are certainly worth searching out. Yes, there is a big world of tea out there. Enjoy! Tea Quiz: Can You Match the Tea to the Leaves? How Much Tea Should You Be Drinking? Hmmm…sounds interesting. I love strong black tea and I love Formosa oolong, but combining the two is intriguing. Thank you!